There’s just something about a printed paper book that I like. Even after the invention of electronic books, I still buy the paper kind, especially for non-fiction. I can make notes, underline, highlight, mark my place, and carry a paper book with me anywhere I go. I’m also a collector. I think most fishermen are. We like to gather fishing lures, rods, reels, electronic equipment, magazines, and especially books. I don’t know of a single serious fisherman who doesn’t have a few fishing books and magazines around the house. I like paper books. My book has been a long time in the making. It was mostly finished last spring. The delay came when I was offered a publishing contract and I needed some time to think about whether I should sign it. After careful deliberation, I decided to design, format, and publish the book myself. Getting the book ready for print hasn’t been easy. 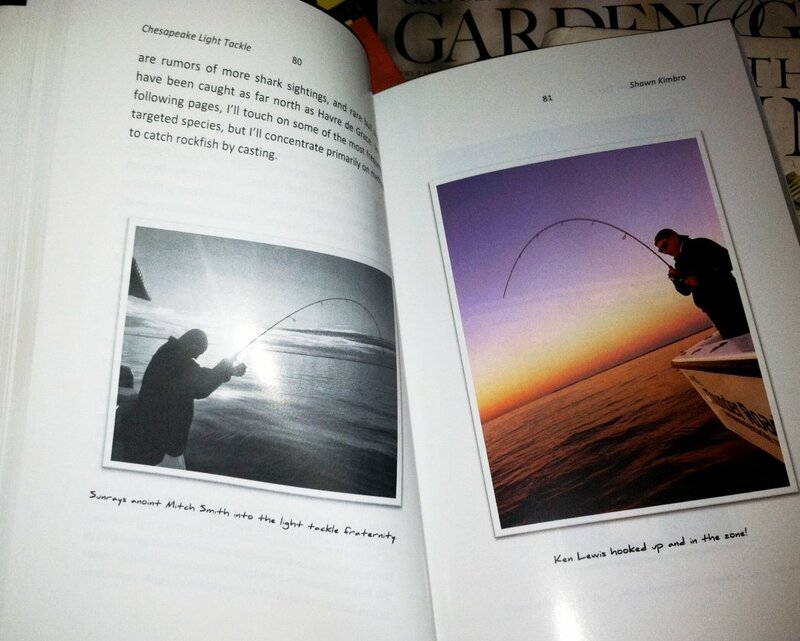 In fact, I got so frustrated with the formatting process that I put it down for a couple of months last summer when the fishing got good. It was all I could do to work, fish, and keep this site up-to-date, let alone teach myself to design a book. I worked at it in fits and starts, but last week, I set a goal, took some time off, and got down to serious business. Thanks to an all-Sunday-night proofreading session by my long-suffering wife, we finished the project by our Monday press deadline. I signed off on the printed proof yesterday. If everything goes as planned, I will have inventory on hand by the middle of next week. Did I say I’m excited? So, here are the details: The book starts with a foreword by Chesapeake Bay Foundation Senior Naturalist John Page Williams. It took me a long time to get up my nerve to ask JP to write a foreword for my book. He’s forgotten more about the Bay than I will ever learn. I’ve read every book he’s ever written, and I try never to miss his magazine articles or editorials. I’ve fished with him on several occasions; every time I go, I learn a lot. Fishing with him is like taking a master class from a maestro. I’m humbled by his participation. Following JP’s foreword is a short introduction in which I say a little about my personal history and thank the many people who have influenced me and contributed to the creation of the book. The first chapter is a fish tale. I won’t give it away but I will say it’s a new story that hasn’t appeared anywhere on my website. Next, I visit the habits of the individual species we target with light tackle. I then touch on techniques like trolling and bait-fishing, then roll directly into the nuts and bolts of light tackle casting. 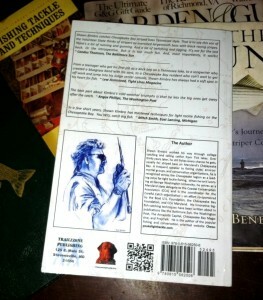 The book holds up on its own, but is also meant as a companion to my fishing reports here on this website. 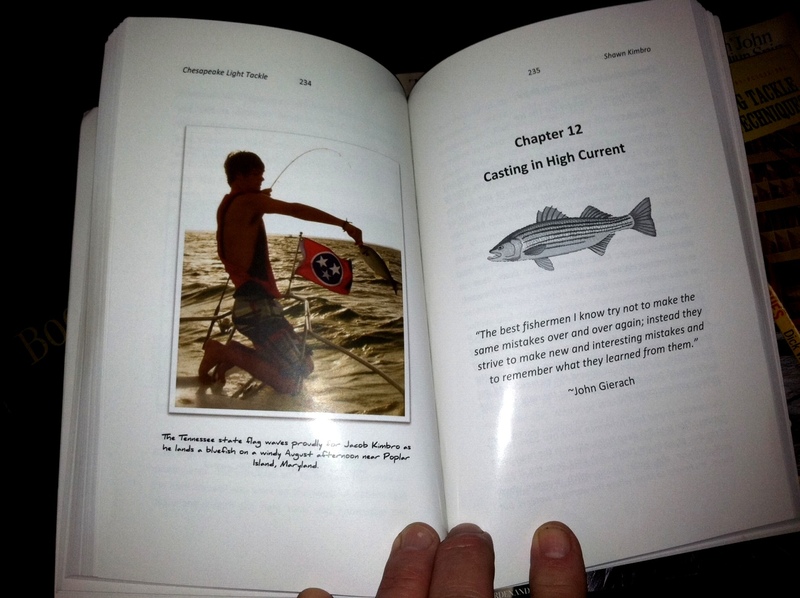 Each chapter starts with a CLT report, then goes into detail about why that fishing trip was (or wasn’t) successful. 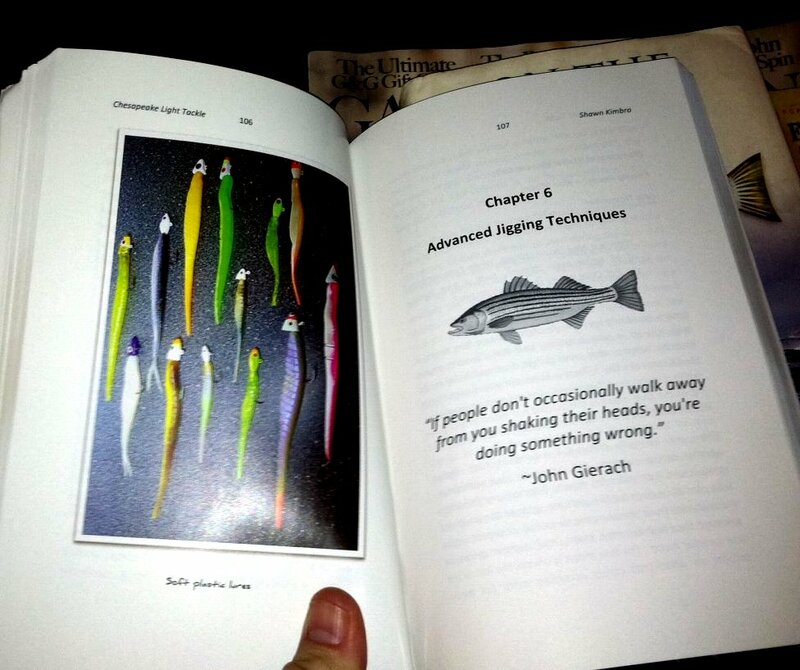 There are chapters on jigging techniques, recognizing seasonal patterns, selecting lures, making lures, choosing the right rods & reels, catching fish on top-water lures, finding fishing spots, unlocking Bay Bridge secrets, fishing warm water discharges, reading currents, watching birds, and much more. I also included a section on developing good catch-and-release practices and another about protecting our natural resources. There are at least forty pictures in the book, and a couple of small maps. Many of the pictures are action shots featuring frequent (and not-so-frequent) fishing partners. The December introductory edition has 21 glossy color photos. Later editions will feature high-resolution black & white pictures. The 6″ X 9″ book is printed on heavy stock eco-friendly paper with a durable high-gloss card-stock cover. The list price is $24.95. 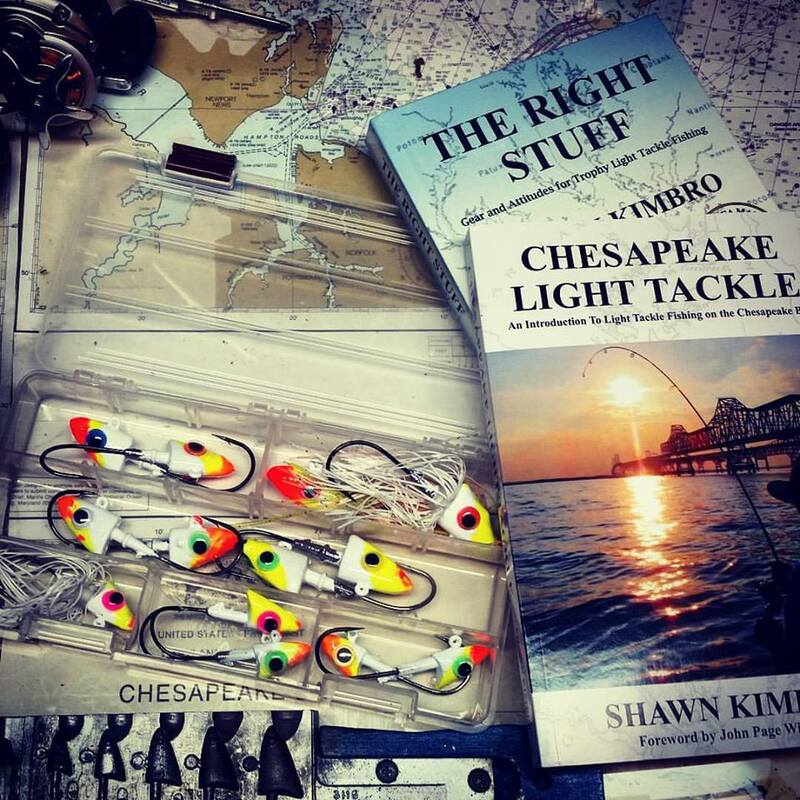 The first place I’ll be offering Chesapeake Light Tackle for sale is the Annapolis Coastal Conservation Association’s December meeting. This is the kick-off meeting for this new chapter and I have high hopes that they will do well. The meeting will be the evening of December 6th at 7:00 PM (Come at 6:00 for drinks and dinner.) at the Boatyard Bar & Grill in Eastport, Maryland. I’m the guest speaker and I’ll talk about wi nter casting and catch and release. There is a cash bar and great food available. A few days after the meeting I’ll put a link on this website with a buy it now button so you can order the book and get it before Christmas. I will only have a very limited number of the introductory editions, so order quickly if you want one. The official release date is January 1, 2012. By that time I hope to have it in as many baitshops and brick and mortar bookstores as will take it. I’ll also make it available to online booksellers like Barnes & Noble and Amazon after the first of the year. I will eventually release an electronic version, but not until later in 2012. So, we’ll soon see how this new expedition in the fishing adventure of my life unfolds. I don’t expect this trip to be all fair winds and following seas, but I’m looking forward to navigating through the shifting swells of wholesale and retail book-selling. If I’m not lucky enough to run into you on the water before then, I hope to see you on December 6th in Annapolis. The printer is unable to get the book stitched using the gloss paper I requested since it’s so thick, so it will be on 70 pound bright white offset stock. That. Sounds. Awesome! I’m in the early stages of learning to fish the Bay so the timing is perfect. Your writing is outstanding and your photos are beautiful. I’ll definitely be looking for a December introductory edition. Good work! Now go take your wife out to dinner. That’ll be a good start. Count on me and my buddies buying it. Shawn, I expect it to jump off the shelves. Is there a picture of that topwater fish that you and Jamie were trying to catch. If not, I might be able to find one for a later edition. Cant wait to get my hands on a copy. Congrats on a major accomplishment Shawn. You have got to be very excited. 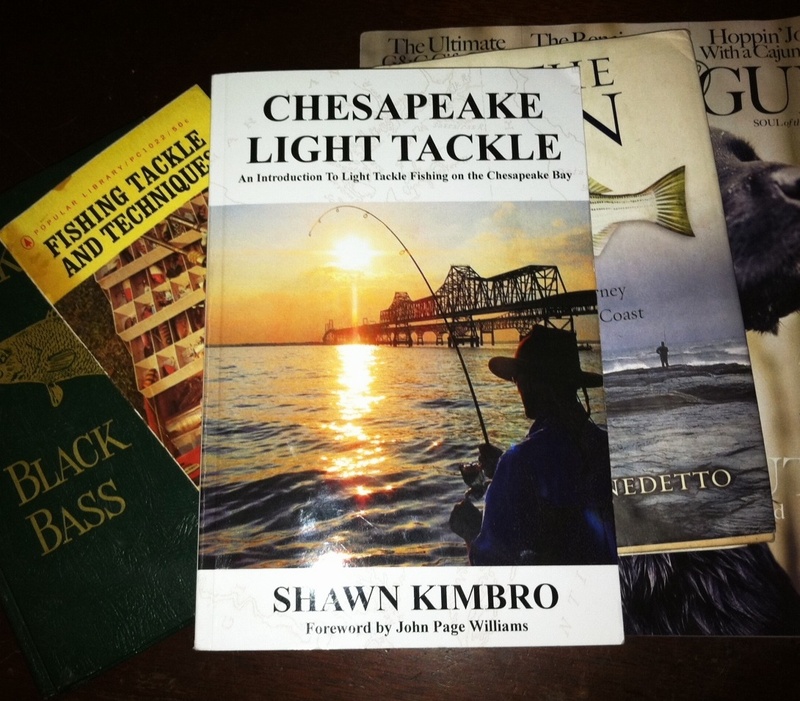 Shawn, just to set the record straight, I’m deeply honored that you asked me to write the Foreword to Chesapeake Light Tackle,and you’ve taught me a lot more about Rockfish Logic in the last six years than I’ve ever taught you. I’m looking forward to seeing the book on 12/6. Thanks for so generously sharing your knowledge! Wow, that’s a doggone endorsement right there. Is it possible to preorder 5 books? I would like to give them for Christmas presents. I would also like to preorder if possible. Congrats, Shawn! Can’t wait to check it out. Shawn don’t pay attention to Rich, he’s just jealous that he didn’t see that “fish” as quick as we did!…You have to admit it was a beauty……..
One thing’s for sure, if we’d hooked that biggun it would’ve took both of us to hold it up for a picture! This is very good news. I will be there at the BB&G and look forward to meeting you. Already on my Christmas list! I’m not sure if you can make the Wednesday, Dec 7th SRRKC meeting?If you think you can let me know and I will post on the board that you are bringing some copies! Congratulations on getting published – well deserved!! Congratulations! I enjoy reading your fishing reports. Looking forward to reading your book. Thanks for the comments. On the preorder thing, I don’t think I can take any, but I’ll let you know here and via Facebook & Twitter(@shawn kimbro) as soon as I have inventory and can start mailing them. I have a great order acquisition system ready to go and we’ll turn the books around very quickly. – Also, note that the Dec 6 meeting at the Boatyard starts at 7:00, but I’ll be there at 6:00 PM with books. I cant wait to get a hold of a copy. Those meetings on Tuesdays are very tough for me to make, or I would come out. I can’t wait! Shawn – that’s a huge undertaking and an impressive one to finish. Congrats on getting the thing published your way. No doubt it will be a huge success. I know a lot of people including myself are better fisherman thanks to your site and the time you put into teaching people through your articles. I can’t wait to read the book. Will Alltackle or Anglers in Annapolis will have this book? Congratulations on your effort, especially a do-it yourselfer. I’m in for a copy, pre order if possible, but may try to make it to the Boatyard. E-mail back if pre-order is possible… Also, read about your upcoming stay in Cape Charles. Not going to make it this year, as I have a family obligation the weekend of 12/9 when my brother and friends are going. Father/daughter dance. Did it for daughter # 1, and gotta follow suit. Will miss the challenge, and Kelly’s. Was hoping to run into you again, and at least chat for a few minutes. Best of luck with the book, and I’ll be looking for it. Shawn-Congrats brother this is awesome news. I look forward to seeing you and the book on the 6th. Best of luck and I’ll be sure to spread the word. it is quite an impressive accomplishment to write, proof, format and publish a book on your own…wow! Hope to see you next week but Tuesdays are tough. see you on the water this weekend. There’s nothing I can say that hasn’t already been said. Congratulations Shawn, that is awesome! put me down for a signed paper copy. Congrats Shawn and I know you have been working on this book for a while now. I will be getting one but I want an personally autographed signed copy, it will be worth more in about 20 years or so… That is a great accomplishment Shawn and you should be proud of what you did and how you will be helping out 1000’s of anglers once they read your book. Looking foward to reading it. I’ll play my (your) Bluegrass CD in the background when I’m reading it! That’s an idea, make it a package deal, a book and CD together! PAID…Sign it and send it! Enjoy reading your reports and advice. Just bought my copy. Can’t wait to read your book! Shawn- I “think” I ordered 2 books tonight thru pay pal. just to verify I DO want 2 books. If the order did not go thru as 2 books please let me know so I can do it again. the 2 books can be shipped together. Got it, Teri – Refunded you $3.00 on shipping. Thanks! Hi – i just ordered the book for my husband and I would like it personalized To Michael – and then perhaps you could you also write a little something funny or witty to give him a chuckle? Thanks! I just ordered three copies (purposefully). One for myself and 2 for some fishing buds. Can’t wait to dig in! Would yo mind signing them for me if you don’t mind? Thanks for sharing your wisdom and happy holidays! Done, Bill. Thanks very much. My brother recently attended a seminar where you were a speaker. He thought you were very knowledgeable and enjoyed your presentation immensely. I’d love to give him an autographed copy of your book for his birthday in June. If you’re agreeable to that please email me back and we can make the arrangements. Thanks, Sean. Just buy the book here on the website. I sign all that go out. Drop me a line in your payment notes and I’ll personalize it to him. Otherwise, I will be at Light Tackle Fest this weekend and I’ll have books.